If land does not have the correct grading, excess water from landscaping will not flow outside the property towards the main city drains which can result in the pooling of water in different parts of your property. 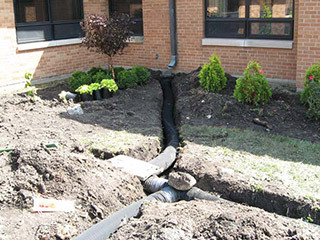 Once grading issues or approvals have been addressed, it is also vital to install the right kind of drainage systems leading away from the structure of your home or commercial establishment. We understand the hazards of water pooling can include: a breeding ground for mosquitos, drowns plants and grass and can be slick and cause accidents. Each drainage systems needs to be tailored to your specific needs, and AK Lawn Care can help with that! We also provide drainage upgrade solutions in case you notice that there is constant pooling of water in different areas of your garden or yard. These jobs are handled as a standalone project and we ensure that all the drainage systems are custom designed for your landscape. We create detailed landscape drainage plans and see how different installations can be used in tandem to create the perfect network for your landscape. If you need a consultation, please call AK Lawn Care today at 734-439-3063.